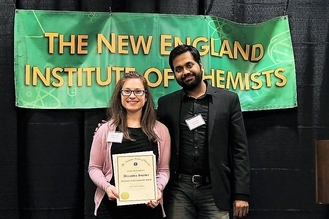 For more than 30 years the NEIC has honored students from colleges and universities in New England who are recipients of the national AIC student award in chemistry, biochemistry and chemical engineering. In addition to attending our Awards Dinner and receiving a certificate, the awardees are given a complimentary, one-year student membership in the AIC. When you nominate a student for the, AIC Student Award , please send the completed NEIC Student Award Nominee Information Form to the NEIC at the same time to ensure that your AIC nominee is eligible for recognition by the NEIC as well. 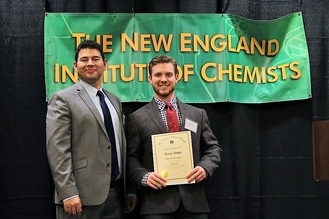 Merrimack College awardee in biochemistry with mentor, Dr. Jimmy Franco. UMASS Lowell chemical engineering awardee with mentor, Dr. Prakash Rai. 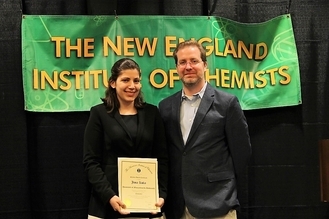 Awardee in chemistry from UMASS Dartmouth with mentor, Dr. David Manka. 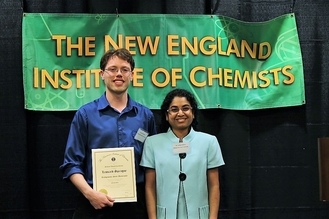 Chemistry awardee from Bridgewater State University with mentor, Dr. Saritha Nellutal.